The average cost to install radiant floor heat is $8-12 per square foot and depends on the size of the space, type of heating (electric vs hydronic) and complexity of installation. In-floor heating is a very attractive luxury to have in your home, especially if you live in a climate with prolonged cold weather. It can be a wonderful feeling to step on a warm floor when you get out of bed, or when you step out of the shower. Also, you can install virtually any kind of flooring you would like, such as: hardwood, vinyl, ceramic, stone or concrete tile. Sometimes, an HVAC professional may recommend that you install engineered wood instead of hardwood, if you have high moisture levels in your home. This way, the floor will be less prone to cupping, bowing or warping. Here is a chart that summarizes the main differences between hydronic and electric radiant heat. This system is designed to be a complementary source of heat in a particular small space, ( a room or a bathroom). 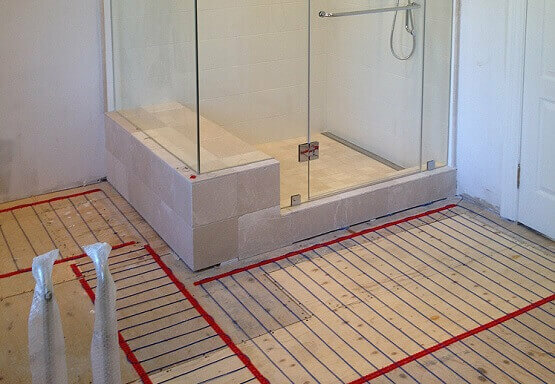 Electric heated floors are typically not installed throughout the entire house, or used as a primary heat source. Because electricity operating costs are hight, radiant electric flooring comes with programmable thermostats, that you can turn on/off to save on heating costs. Its important to note that electric heating mats will not make the floor feel “warm” or “hot” during the cold winter months. Rather the floors will feel “neutral” to the touch, which is very pleasant. Loose electric cables – this is the cheapest way to heat your floors. The cables come in a spool, and you can choose how close or far apart you want to set them. The closer they are the faster the area will heat up and the warmer it will be. The cables need to be fastened either by hot glue or staples. Then, they need to be embedded either onto a tile backer board ( cover with thin-set) or installed directly onto the subfloor with self-leveling compound poured over it, to achieve a smooth surface. Overall, the biggest downside is a very consuming, labor intensive installation, which may negate the savings on the materials. Another big downside is that the cables can cost 2-2.5 times more to operate than electric mats. Electric resistance cables attached to a mat – these are installed over the subfloor. The mats need to be set in place with a layer of thin-set mortar. Then, the floors are typically finished with tile either ceramic or stone. This type of electric radiant heat is most effective in the bathrooms or kitchens. 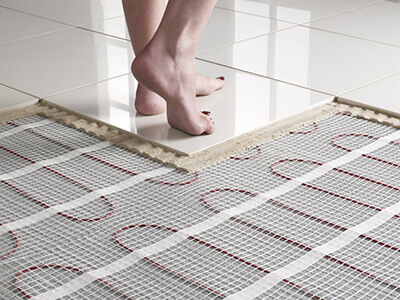 Electric floor heating mats – these work well under floating floors, such as bamboo, engineered wood, or laminate. These mats are simply taped in place under the floating floor, which makes the installation very fast and simple. One of the biggest advantages of the electric mats is that they can be either fixed sizes, or made from flexible mesh, allowing you to customize the layout according to your needs. This means that you can easily work around a kitchen island, shower stall, etc. 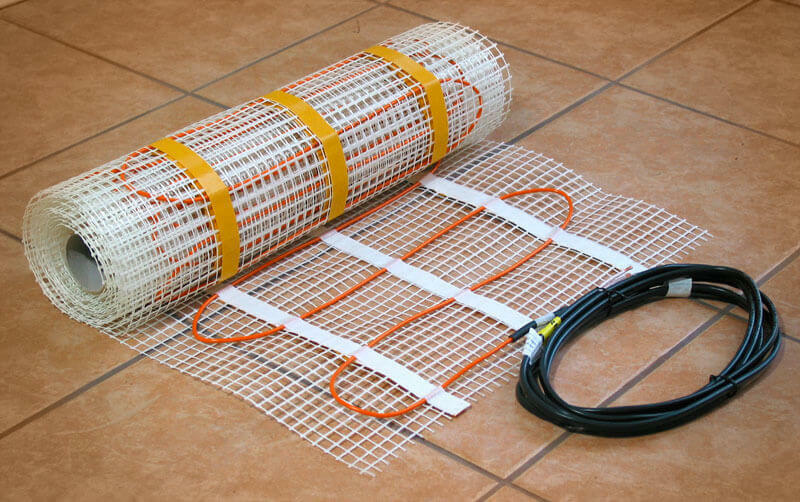 Electric radiant floor underfloor heating pads – if you are on a tight budget and don’t want to dismantle your flooring, you can install these underfloor mats between the floor joists. A huge advantage is that they can be installed under any type of flooring, even nailed down hardwoods. These pads can increase your floor temperature by as much as 15°F. The only requirement for this system is that there must be access from the basement of crawl space to reach the joists. Depending on the materials and type of installation you choose, you will spend $5-7 per square foot on the electric mats and cables. Some systems can cost as much as $20 per square foot. Together with labor your total cost of installation will be $10-12+ per square foot, depending on the size of the space, complexity of the job. If you are interested in installing radiant electric flooring mats on your own, there are DIY kits available from companies like Warmly Yours. The total cost will be around $950-975 This includes electric mats to cover an 8×10 space, programmable thermostat, the installation kit as well as the cost of shipping to your house. Comparatively, radiant electric heat is about 20-25% more expensive to install than hydronic heat. Your total cost to operate radiant electric heating mats will depend greatly on local electricity costs, how long the system is running, and the quality of insulation. In fact poor insulation can add as much as 15-20% on top of what it would cost to operate electric heat floors mats with good insulation. On average, homeowners report spending $0.20-0.35 per day to run electric heat for 4 hours a day (2 in the morning and 2 in the evening) in an 8×10 bathroom space. This is equivalent to $6-10.5 per month. It is possible to keep the system running all day, at which point your operating cost will be about 37% higher, or $8.22-14.4 per month. A hydronic system is usually installed throughout the entire house. It provides the most uniform and comfortable heating compared to other options. Your home will be free of drafts, dust, allergens, or uncomfortable cold zones, where the heat has not reached. Hydronic heating is also a lot more efficient and cheaper to operate compared to other systems. This is because water is the best element for conducting heat and keeping the warm temperature. In fact, water can hold 3,500 times more heat than air can. Therefore, your system operating time is actually reduced. Moreover, it can operate at a lower temperature, compared to electric or forced air systems. of installation that is best at preventing potential leaks. If you already have a hydronic heating system (radiators) in your house, you can also add radiant floors. The average cost of this retrofit on the first floor is $6 – 8.5 per square foot, including materials and professional installation. This includes tearing out the old floor and installing a new one (doesn’t include the cost of the new floors). The tubing is attached to the subfloor, so its important to ensure there is access to it from the basement or crawl space. However, if you are doing a retrofit on the second or third floor, the cost can be at least $12-15 per square foot, because it may be necessary to remove the ceiling in order to access the subfloor the tubing will be installed. Moreover, such a wide range in pricing depends on the overall size of the system and the number of heat zones you are looking to have. Keep in mind that adding hydronic radiant flooring during the home construction phase will cost less than doing a retrofit install, because you will not need to drill through existing floors to install the tubing. Moreover, the larger the space, the cheaper your cost per square foot will be. Often contractors can charge up to 30-40% more per square foot to install hydronic heat in a small space under (1,000 sq.ft.) compared to a space of 4,000-5,000 sq.ft. However, if you don’t already have the entire heating system in place (boiler, radiators, piping, etc), you total cost will be much higher. It can range from $6,000 all the way up to $12,000, depending on numerous factors. The boiler alone will cost $2,000-5,000 depending on whether you want oil or gas, condensing vs. none-condensing. If you decide that you want to add hydronic radiant floors, you should also be aware of its downsides. In terms of potential risks, one of the biggest is that a pipe may freeze and burst, or rust and leak. In fact, the chance of this is rather high because all the piping is made of plastic, which is the LEAST durable material, with the SHORTEST service life. One way to reduce the risk of leakage is to install more expensive PEX tubing (cross linked polyurethane). These tubes have been designed as a leak free alternative to plastic, and are now used pretty much exclusively during the system installs. At the end of the day, you may be stuck with a major challenge – leaking water under your floors. This will need to be immediately repaired to prevent major damage, but you may have to deal with paying for mold remediation as well as new flooring. Indeed, if such a big problem happens, you could end up spending anywhere from $5,000-12,000 plus depending on the size of the damaged area to get rid of mold, fix the subfloor and install new flooring. 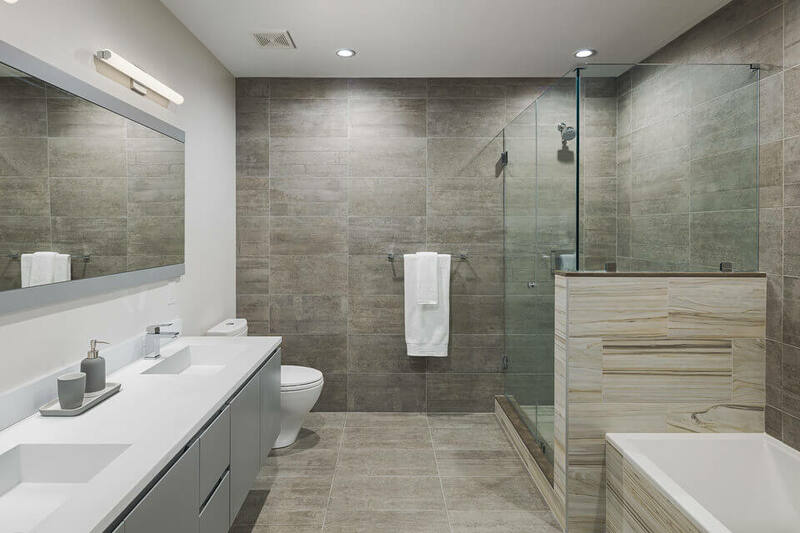 Many homeowners that can’t afford to install a whole house in-floor heating system, choose to just have it in the bathroom. This actually is an affordable upgrade. The average cost of installing electric radiant flooring in a 100.sq.ft. bathroom is $700-850. Pricing per square foot for tile floor heating runs $5-8. Typically, electric mats are installed, as this is the easiest retrofit to complete, if the houses is not already equipped with a boiler. You electric radiant floor can be controlled by a thermostat, so it doesn’t have to be on all the time. Reported operating electricity costs for heated floors in the bathroom are equal to the operating cost of 3 100W light bulbs – not expensive! While its possible to install radiant heating pretty much under any type of flooring, some floors will be much better at retaining a pleasant warm temperature than others. Natural hardwood flooring – works well, with the only downside being the gradual expansion and contraction of wood planks as they come in contact with rising warm air. To minimize this issue, its recommended to install shorter length planks or strips, as opposed to long ones. Laminated or engineered wood – works well and does not have the expansion/contraction issue. Linoleum/marmoleum – some types of these floors may emit harmful fumes upon coming into contact with warm air, and may therefore not be compatible. 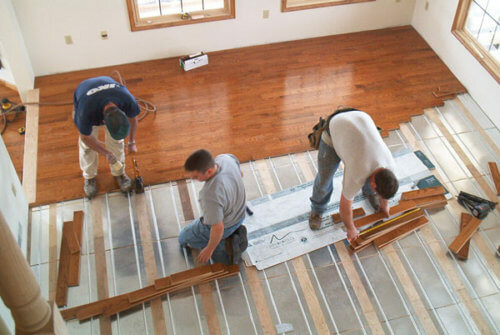 Its best to contact your flooring manufacturer to find out if they would be a good fit for radiant heat. Ceramic or porcelain tile – one of the best flooring options for radiant heat. There a double of advantage because ceramic tile both conducts the heat well, and also stores it for sometime after. This means that ceramic radiant flooring will always be very pleasant to the touch. Stone tile (marble, slate, travertine, granite) – this is another type of flooring ideal for hydronic heat. Natural stone will store rising heat for the longest amount of time, compared to other materials. While it will take initially a long time to warm up, it will remain warm for many hours to come. Carpet – this is not the best option for radiant heat, because carpet has strong insulating properties. As a result it will actually prevent the warm air from rising through the floor. In fact, rooms are covered with carpeting precisely to keep the flooring warm without requiring extra heat. Cork flooring – similar to carpet, cork has very strong insulating properties and is relatively warm to the touch on its own. Therefore, there is really no need to install radiant heating under it.